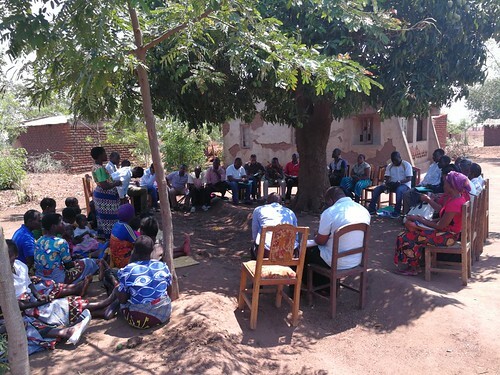 A focus group discussion exercise on the Feed Assessment Tool (FEAST) at Mmora village in Kadewere in Malawi’s Chiradzulu District on 8 Nov 2018 (photo credit: ILRI). A new research-for-development initiative is helping smallholder farmers in southern Malawi increase the productivity of their livestock and crops to enhance food security. The agribusiness Crop Livestock Integration and Marketing in Malawi project or CLIM2 is improving animal feeding and crop farming practices and market access for farmers’ produce. CLIM2 draws on lessons from an earlier project in Zimbabwe known as ‘ZimCLIFS’, which enabled small-scale farmers in four district to better integrate crop and livestock production, and improve markets to increase their food security and incomes. CLIM2, which is part of the three-year Small Scale Livestock and Livelihoods Program (SSLLP), is implemented in Chiradzulu, Thyolo and Balaka districts in the south of the country. Farmers in the three districts depend on small-scale crop and livestock farming (rearing goats, sheep and keeping chicken) for their livelihoods and they face serious challenges in feeding their animals because their land sizes are small (averaging about 0.5 acre) and communal grazing areas are inadequate. One of the CLIM2’s goals is to help these farmers incorporate farm residues in their livestock feeds which will make livestock diets more nutritious thereby improving the quality of the meat and milk. From 6-10 November 2017, the project’s partners who included government and NGO partners were trained in using the Feed Assessment Tool (FEAST). The tool will be used in the project sites to assess local farm feed resources and come up with strategies for helping farmers maximize the use of their farms to meet the nutritional requirements of their livestock. The training in Blantyre attracted more than 27 (3 women) participants including 19 ( 2 women) participants from the Ministry of Agriculture and 7 (1 woman) from SSLLP. They included senior government officials: 3 chief animal health and livestock development officers, 2 agriculture extension development officers and 2 assistant veterinary officers. The training was also attended by the SSLLP program manager, 3 district field officers and 2 district program officers working with the program. An ILRI graduate fellow also participated. The five-day workshop comprised four days’ classroom lessons and a day’s field trip to test the FEAST tool at Mmora village in Chiradzulu District with the Thobola Women group. Livestock feeding strategies for Mmora were developed by the end of the training based on findings from the field test which involved 2 farmer groups each composed of 12 farmers (10 women and 2 men). The FEAST facilitator trainees from this workshop will form ‘FEAST teams’ and facilitate the FEAST methodology in their project sites. They will also lead focused group discussions with farmers to provide an overview of the farming system and emphasize livestock feed aspects, complete simple quantitative questionnaires with a subsample of farmers. They will also produce FEAST reports from the project sites that will help inform intervention strategies in target districts in addition to being involved in designing and implementing ‘best-bet’ feed interventions with farmers. 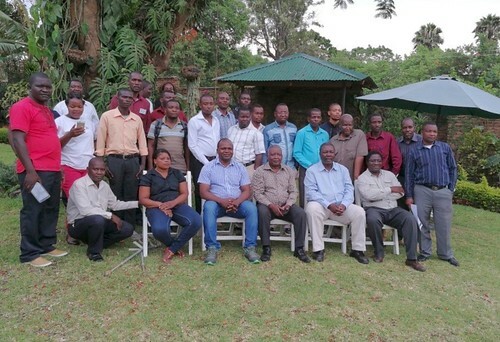 The government officials and program officers at SSLLP who attended the Feed Assessment Tool (FEAST) training workshop in Blantyre, Malawi, in November 2017 (photo credit: ILRI). The FEAST outputs from this initiative will be part of a PhD study by an ILRI graduate fellow working in the project. SSLLP is implemented in Malawi by the International Crops Research Institute for the Semi-Arid Tropics (ICRISAT) and the International Livestock Research Institute (ILRI). The program is funded by the European Union under the grant component of the Farm Income Diversification Program (FIDP) with the overall aim of increasing income and livelihoods for smallholders, the rural poor and rural youth through sustainable intensification and diversification in mixed crop-livestock systems. Tags: feast, Small Scale Livestock and Livelihoods Program. Bookmark the permalink.